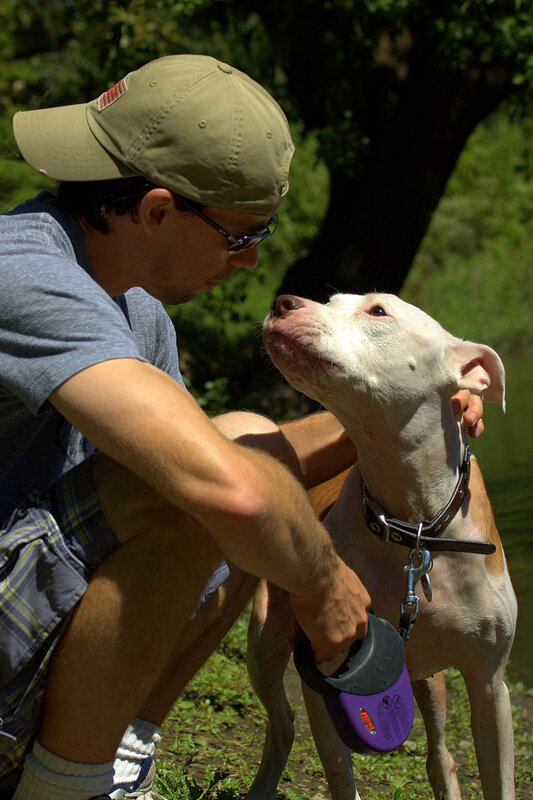 It's no secret that pit bulls have been portrayed negatively by the media over the past couple of decades, and the Internet has allowed that portrayal to be exaggerated. In the midst of some of the worst times, my wife, Clara, and I adopted a pit bull named Wallace, who was labeled by the shelter as a liability. This added a third dog to our household, and we had to pull some strings to get him out of there in the first place. We were met with concerns from both of our families, and then faced much harsher feedback from people online who we'd never even met. We were told we were "certain kind of people" because we had "that type of dog" -- whatever that meant. We were told to sleep with one eye open because Wallace would attack us in our sleep. We were told that one day Wallace would snap, and we'd be sorry. I always found it interesting how people could have such strong opinions about a couple of people and a dog they've never met. My invitation for them to get to know us before they judged us typically ended with them fading away. Their comments were obviously based out of fear, and for whatever reason, they were trying to instill that same fear into me and anybody else that may be reading. Fear is an interesting thing. On one side, it makes us cautious and can keep us safe. On the other, it can imprison us by limiting what we're able to experience. How we choose to respond to our fears can dictate our lives quite a bit. Our situation was no different, and we had a choice to make. What if they were right? I can't predict the future. I don't know what's going to happen a week from now. Or a year from now. Do we listen to that fear, and euthanize Wallace to guarantee that he never hurts anybody? Or do we take our chances? Clara and I made our choice, and Wallace remained alive. Our adventure began with an interesting twist when we discovered that Wallace liked to catch Frisbees, or the generic term, flying discs. We discovered that there were actually competitions for dogs that like to catch discs, and we proceeded to graduate from our backyard to the park to the competition field. We spent the next few years traveling all over the country competing against the best disc dog teams in the world. Wallace looked different than most of the dogs present, but we did pretty well for ourselves. In 2006, Wallace and I were crowned the Cynosport World Champions, and in 2007, we were crowned the Purina Pro Plan Incredible Dog Challenge National Champions. In between competitions, we performed for thousands of people at venues such as the Twin Cities Pet Expo. After shows and competitions, many of the families would stick around to meet and pet the dogs. Wallace was always happy to oblige and dole out his fair share of sloppy dog kisses. Through all of it, Wallace had yet to "snap." He was still young though, and he had a good amount of time left. 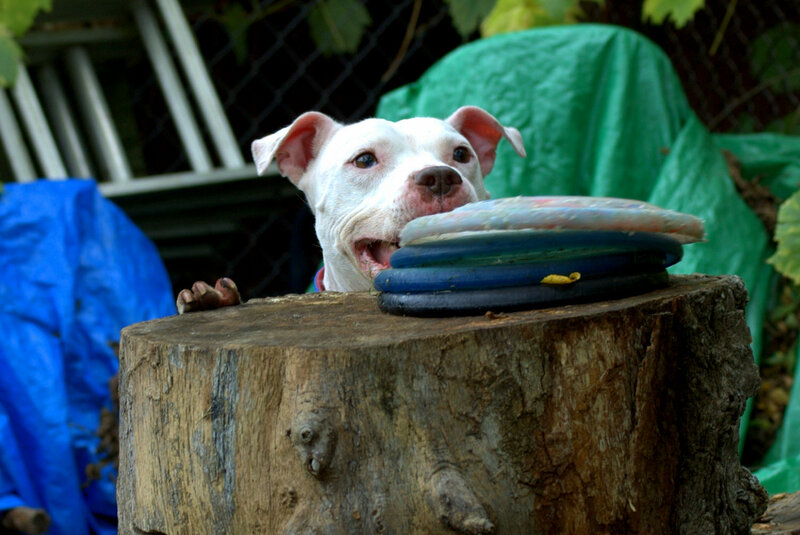 We cut back on competing, and Wallace's story was put to paper in the book Wallace: The Underdog Who Conquered a Sport, Saved a Marriage, and Championed Pit Bulls One Flying Disc at a Time, by Jim Gorant, author of the NY Times Best Seller, The Lost Dogs. Wallace had been having some health issues by this point, but we were excited to introduce him to the world with the book launch. Unfortunately, upon release and after our first book signing appearance, Wallace unexpectedly collapsed. With some great vets, and a lot of luck on our side, he pulled through. However, we discovered Wallace had a cancer called hemangiosarcoma, and was only given a prognosis of two weeks to three months to live. It seemed his window to "snap" was closing. That news hit hard, and we were not ready to say goodbye to the dog that set us on this amazing adventure in the first place. We wanted more experiences together. We wanted him to have more experiences with us. Clara had the idea of doing a bucket list, which we quickly got started on. We went for a ride in a motorcycle sidecar. We traveled to the Pacific Ocean. I set up a miniature golf course in our house. Wallace picked up a club in his mouth, knocked a ball off the tee, and got a hole in one. Wallace even got to trade a few kisses with the amazing Betty White. Seven months later we celebrated his 11th birthday by showering him with stuffed toys, all sent in by people whose lives were touched by Wallace in a positive way. And my favorite one, tossing a few final throws to watch Wallace snag that round piece of plastic out of the air like he always did. We documented it through videos and pictures, and with all these last minute excursions, Wallace still had yet to "snap." Nearly one year later, Wallace was fighting off the hemangiosarcoma better than anybody predicted. Unfortunately, a second cancer, transitional cell carcinoma, was causing him a good deal of discomfort. The complications between the two cancers left him no good options, so it became time for Clara and I to make the decision we knew was coming, but kept hoping would never actually arrive. He had a good last day, and our vet was able to come out to our house to keep him as comfortable as possible. He greeted them with his tail wagging, settled back into his bed, and shortly after, laid still and breathless as we thanked him for helping us become better people. The hole left in our household was partnered with the closure of Wallace's final day. The argument around him is done. He never attacked me in my sleep. In fact, one of the things I miss most is going to bed and calling out "Where's my pit bull? ", then hearing Wallace running to jump up on the bed and cuddle up beside me as I would fall asleep. He never "snapped", and he never will. I'm grateful we didn't allow somebody else's fear to imprison us from experiencing years of wonderful memories with Wallace, and I'll never be sorry for that. The reality is that it is extremely rare for dogs to "snap", but dogs can't defend themselves with words. Whether it's by well-meaning dog owners that just don't know any better, or ill-intentioned dog owners that need an "out", it's easy for people to use the dog as their scapegoat. Regardless, dogs don't have too much of a choice in the matter of where they end up and what happens to them once they get there. Fortunately there are a lot of caring and responsible dog owners out there who give their companions a great life. On the flip side, considering what I've seen many dogs go through, and what some people expect them to endure, it's a testament to dogs, specifically pit bulls, that we don't see more negative headlines in the news. Was Wallace perfect? No, he wasn't. But just like the thousands (if not millions) of other pit bulls that you'll never hear about because they are just too good to ever make the negative headlines, he was one heck of a dog.